The artistry conveyed in this decorative Benjarong attests to the mastery of artisan Sakda. A delicately domed lid tops the cylindrical body. Flowers outlined with gild fill the blue background. 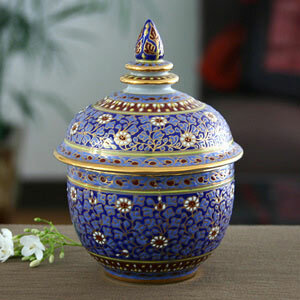 This porcelain jar is created in the ancient Benjarong tradition. Benjarong, which means "five colors" in Sanskrit, is a traditional style of hand-painted Thai porcelain. This benjarong is hand-painted by Sakda Phetdarakul. 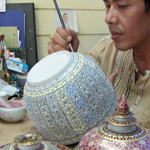 The master artisan operates a small workshop in central Thailand. ... Read Sakda's full biography on Ezistock Blog.